We’d love your help. Let us know what’s wrong with this preview of Rheia by Cassandra Page. To ask other readers questions about Rheia, please sign up. When their father’s ship docked in the harbor, Rheia and her brother were there to meet it. On board were four young people who were to be sacrificed. Two female; two male. To pacify the gods and keep the demon Typhein under control; the sacrifices had continued for more than a century. It had never before concerned Rheia – it was just a part of her life as she knew it. But when the town, and subsequently her mother, father and grandmother, heard that one of the girls had killed herself and ther When their father’s ship docked in the harbor, Rheia and her brother were there to meet it. On board were four young people who were to be sacrificed. Two female; two male. To pacify the gods and keep the demon Typhein under control; the sacrifices had continued for more than a century. It had never before concerned Rheia – it was just a part of her life as she knew it. Rheia by Aussie author Cassandra Page is a stunning, breath taking and tissue-inducing fantasy/steampunk/young adult novel which was unputdownable! Absolutely brilliant in my opinion. Filled with tension, the characters were extremely well crafted. I loved the three main caregivers – Dora, Erika and Yalee – and the reasons for their positions. Also, Rheia’s grandmother, Charis. The plot was exceptionally well done; flowing smoothly and well written. 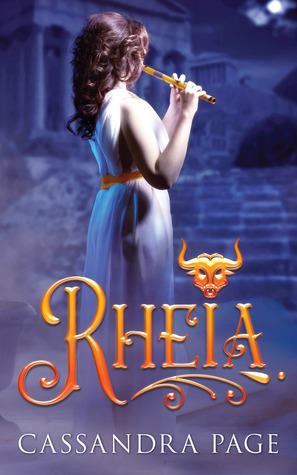 I thoroughly enjoyed Rheia and highly recommend it. When I first started reading this story, I wasn't entirely sure it was for me. It seemed like the women were meek, oppressed, and poorly treated by men, and it upset me a little. However, watching Rheia evolve throughout the story definitely made up for it. visit the site for awsome giveaway going on right now!